The guided-missile frigate USS Rentz is scheduled to return Friday to San Diego from a seven-month deployment, the Navy announced today. 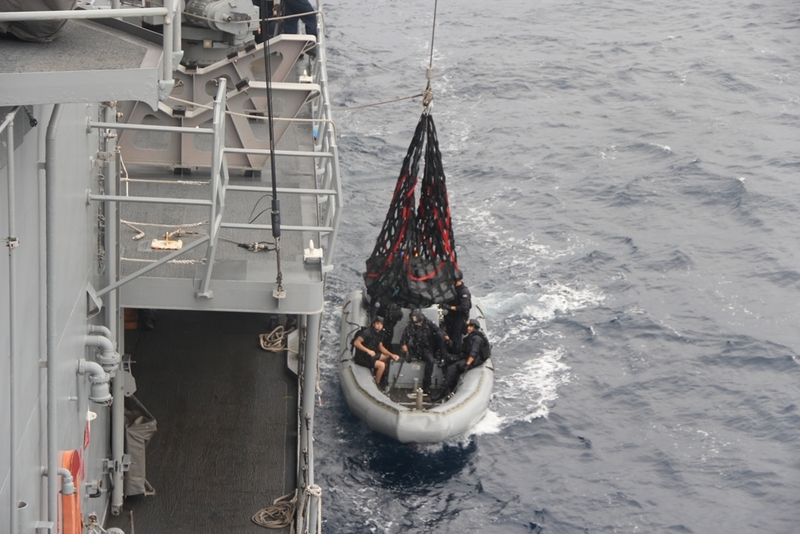 Personnel attached to the guided-missile frigate USS Rentz prepare to offload seized contraband found aboard a small vessel during the ship’s most recent deployment. Photo from U.S. Navy. Since heading out last July 25, the officers and crew of the frigate, along with Helicopter Anti-Submarine Squadron Light 49 and U.S. Coast Guard law enforcement detachments, disrupted four shipments of cocaine in international waters off the coast of Central and South America. The haul totaled nearly 2,000 kilograms, according to the Navy. Besides the drug interdictions, the Rentz transited through the Panama Canal for a port visit to Cartagena, Colombia, and participated in an exercise with South American navies.